Limit access inside to prevent soot particles from being embedded into upholstery and carpets. Keep hands clean so as not to further soil upholstery, walls, and woodwork. Place old sheets or towels over rugs, furniture, and carpet traffic areas. If electricity is off, empty freezer and refrigerator and prop doors open. After a house fire, don’t assume that someone is going to contact your insurance; you need to. Many carriers also provide help for daily expenses like emergency lodging if you lost your charge cards and I.D. in the fire. Remember to retain all receipts to make a claim. Contact the police. Empty homes are attractive to squatters and looters. Alerting local police of the situation might help your property remain safe. After your fire department declares the home is safe to enter, you can board up windows and doors to provide an additional layer of security. Hire a pro such as Regional Property Group to secure the property. Similar to an official “police report,” this form will have an incident number, document what areas in the home were involved, and list the time/ date of the incident. The fire department will include specifics of who was there, and what resources were there, plus other relevant information. Each municipality is different– to get a copy of a fire report you may call the Fire Prevention Bureau, the Fire Marshall or the Arson Unit. Financial responsibilities will continue regardless of your fire. Many insurance policies cover mortgages, but it’s important to check on other recurring costs like car payments as well. Additionally, consider canceling cable and internet services if you won’t be in your home for several months. Insurance carriers require detailed information like make and model, serial numbers, and receipts. This can be difficult if your home was completely destroyed or you don’t yet have access to it. If you have a computer, searching for online bank statements can help you present proof of purchase and exact costs. Then keep your receipts when replacing these items to ensure you’re quickly reimbursed. It’s also critical to make a list of important documents that were lost such as drivers’ licenses, birth certificates, passports, titles and deeds, medical records, and tax documents. Turn off the HVAC unit immediately. Then tape cheesecloth over the registers and plan to change the disposable filter daily for a few days. Don’t send soot and smoke into any unaffected areas. When your home is deemed safe to re-enter, remove everything not affected by the fire. It’s also recommended to clean items after they’re removed from the house. Professional cleaning services, such as Regional Property Group, have the experience and tools to restore fire-affected items. Consider renting a storage unit to protect salvageable items. Leaving possessions in your home can cause further damage and make it more difficult for your repair crew to work around. 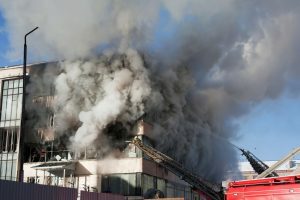 If you have had a fire, you will need more than a cleaning crew or a general contractor, you need a team to act as your advocate with through all the steps of the process. Lessen your stress by contracting with a central resource familiar with insurance companies, agents, adjusters, and all the many others involved in a loss. In southern Maryland, that team is Regional Property Group.